The report surveyed more than 6,000 developers from 17 countries to reveal the trends driving the world of coding this year. Topics covered included programming languages, development environments, databases, issue tracking, continuous integration, deployment and DevOps. JetBrains’ statically typed programming language for JVM, Android, browser and native has been gaining in popularity since Google announced it was adding Kotlin to Android in May of last year. The report finds 75 percent of developers are using JDK versions of Kotlin (with JDK 8 as the most popular version), 48 percent are using Android versions (with Oreo as the most popular) and 13 percent are using Kotlin JS types. Fifty-four percent of developers have been using Kotlin for less than six months, and 49 percent stated they are using the language for some projects, but have not replaced any languages they already use. Forty-eight percent used other languages before Kotlin, and have changed their tool sets. When it comes to tools, developers cited using IDEs, source code collaboration, lightweight desktop editors, issue trackers, and continuous integration or continuous delivery tools the most. Eighty-two percent of respondents use IDEs while 69 percent use editors. Of those using IDEs and editors, only 12 percent cited that they don’t customize their IDE/editors. In addition, 77 percent use the dark theme for their editor or IDE. The top continuous integration systems include Jenkins, Travis CI, GitLab CI, TeamCity and CircleCI. The report also indicated that developers are moving from self-hosted and on-premises solutions to the cloud providers such as AWS, Google Cloud Platform and Microsoft Azure. JetBrains predicts over the next year private and local servers will drop by six percent and 11 percent. 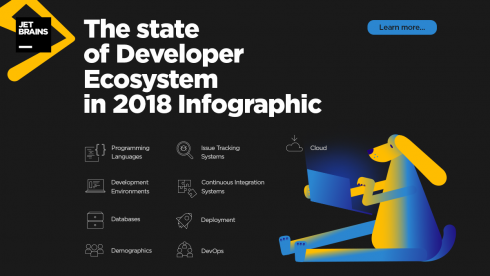 Other findings included developers build web back-end and front-end apps the most, whether it is for money or as a hobby, and 35 percent of developers develop for both Android and iOS. When developing for mobile, 72 percent use native tools while 43 percent use cross-platform technologies and frameworks. Some fun facts about developers include 77 percent listen to music while they are coding; the top music to listen to includes electronic, pop and rock; 53 percent sleep seven to eight hours a night; 85 percent code on the weekends; and 57 percent prefer coffee over tea.